On 9 January 2018, head of the Chameria Foundation for Democracy Festim Lato rose awareness about Greece’s disrespect for the Cham people’s right to justice on the occasion of a conference organised by the Alliance for Liberals and Democrats for Europe (ALDE). In his intervention, he highlighted that the European Union (EU) is a union that embraces strong moral values but that this is not necessarily reflected in the attitude of certain of its members. The EU is stuck in a political turmoil as the contradiction between self-determination and political unity is not resolved. Due to artificial borders based on the outcome of wars and forced displacements, history is still a burden for the Union’s unrepresented. On Tuesday 9 January 2018 Chamerian president Festim Lato, prime-minister Ali Aliu and Mr. Jeroen Zandberg participated in a conference organised by the European liberal group. The conference titled ‘The State of Democracy, the Rule of Law and Fundamental Rights in the EU - Safeguarding a community of values’ brought together many parliamentarians from the liberal family in Europe. Guy Verhofstadt, the political leader of ALDE opened the conference with an outline of the challenges that Europe faces and ways to implement the liberal values in the European institutions as well as in the national and local governments. The speakers at the conference each focussed on specific areas of society where threats, challenges and opportunities for the liberal values come to the fore. Many countries within the European Union are deviating from the common values that hold the European project on course for a future of greater freedom and prosperity. The speakers at the conference made it clear that it is the task of every individual to stand up for the rights of all European citizens and where these rights are violated, specific actions must be taken. Several examples of these actions, from individuals as well as institutions, were presented. Sophie in‘t Veld, the vice-president of ALDE chaired the meeting and emphasised that article two of the treaty is the core of what the EU is all about. The strong focus on the Rule of Law within the EU shows that it truly is a political union which makes moral choices and is constructing a community of values. President Festim Lato also attended this important conference, which directly impacts the lives of the Cham people. Greece is a member of the EU but is violating the rights of the Cham. 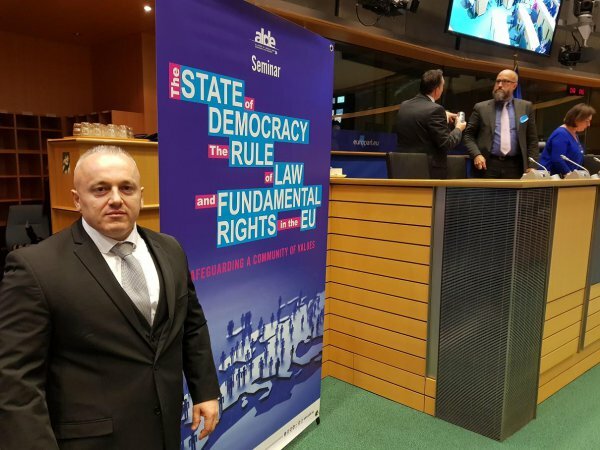 At this conference president Festim Lato was able to bring the issue of Chameria into the halls of the European Parliament and discuss it with several important parliamentarians and specialists from international institutions. Mr. Jeroen Zandberg was also able to have a contribution at the event to highlight the dire situation of the Cham people. The accession talks that the EU is currently having with the Western Balkan countries should increase the European values in this volatile region. However, in some respects these accession talks make it harder for the Cham people to get justice since many of the Balkan countries who are already a member of the EU, especially Greece, place pressure on the Albanian government to make it harder for the Cham people to organize themselves and advocate for the return of their properties and citizenship. The accession talks should of course not be misused to downgrade the European values, but instead be an opportunity to enlarge the European family and deepen its common values.